So where do mid handicappers look to find clubs that can continue to improve their game? One of the best areas to attack to push their golf game to that next level is finding a new set of irons that fit their game by improving accuracy and extending distance. The best irons for mid-handicappers have several characteristics that will help boost ball height on shots as well as dramatically decrease the length of birdie putts. 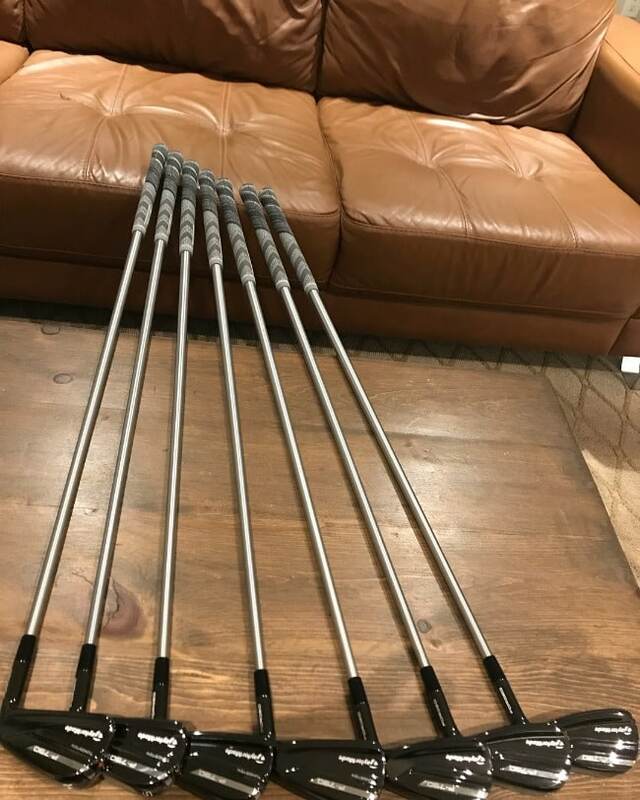 For those golfers who have handicaps that sit between 10 and 18, they can push themselves to improve by taking the time to find the right irons for their game. Here are three of the best iron sets for mid-handicappers that offer a variety of features that will delight and upgrade their golfing experience. 2.1 What players are considered as mid-handicappers? 2.2 Which part of the game can irons for mid-handicappers help me with the most? 2.3 When should I consider buying an iron set for mid handicappers? 2.4 Should I pick an offset hosel? 2.5 How wide should the sole be on my irons? 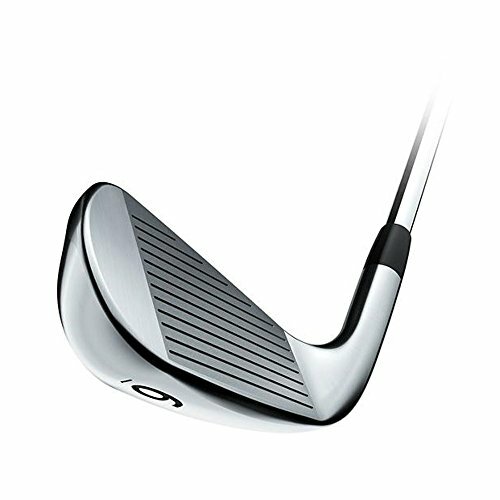 2.6 Which head design should a mid-handicapper go for between cavity-back irons and muscle black/blade irons? 2.7 Should I pick steel or graphite shafts for my irons? 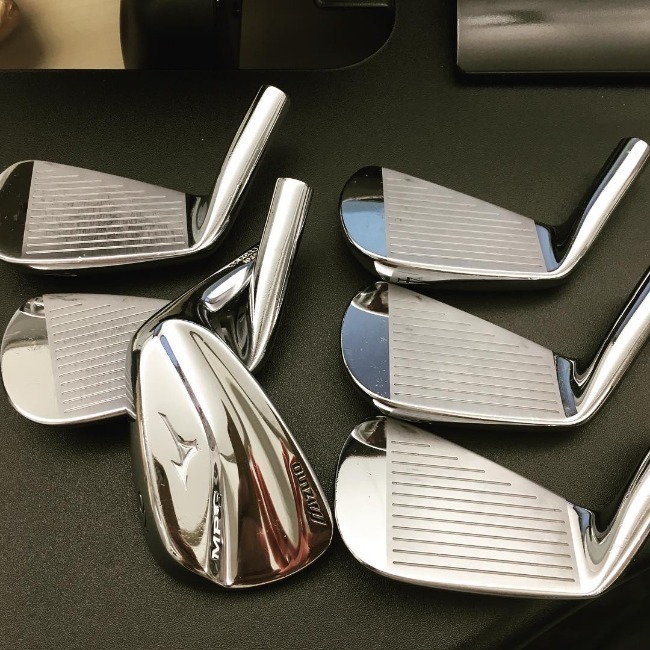 2.8 As a mid-handicapper, which irons should I avoid? 2.9 What's the difference between irons for mid handicappers and low handicappers? 2.10 What are the different types of irons available? 2.11 What are the designs available for irons? The Cleveland Launcher HB Iron Set can change your game overnight. These are some of the longest, highest and most forgiving irons we’ve ever played for the intermediate golfers. More sophisticated than your typical game-improvement iron, the Launcher HB iron set is a terrific option for golfers breaking into the mid-handicap level. What makes the Launcher HB such a fantastic iron set for the mid-handicapper is due to the high-quality construction. Cleveland has hollowed out the center of the clubhead to move more weight around the perimeter, so off-center strikes stay straight and with the same punch that a normal hit would make. These are great irons that all mid-level players should consider for their next set. One of the more unique club sets on the market is the Cleveland Launcher HB Iron Set. 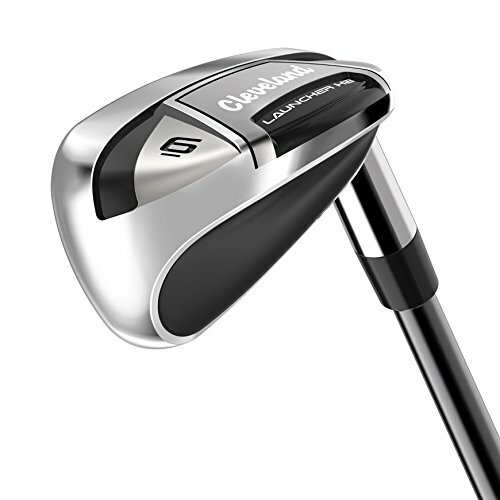 With a hybrid-like design, Cleveland has elevated the level of the Launcher set through creative engineering that has made one of their longest and most forgiving club sets to date. For the Launcher HB irons set, it all begins with their appearance. The hybrid design improves contact and allows the golfer to get the ball into the air faster for long and straight shot-making ability.With the lack of mass inside the clubhead, Cleveland has moved the weight around the incredibly strong club face. As a result, the Launcher has terrific forgiveness that reduces side spin preventing those score-killing hooks and slices that can ruin an afternoon. All the Launcher clubheads utilize Cleveland’s patented HiBore Crown technology. Now why this important for the average golfer is because the technology has moved the center-of-gravity to a low and deep area on the clubhead. This design feature helps give the golfer a high ball flight and longer distance. For the beginning golfer or mid-handicapper, this improved launch angle will give the player a tall and soft entry into the green. Another reason that the ball jumps off the clubface of the Launcher irons is a high-strength steel insert that flexes on impact. Now that may sound like a negative, but it helps on off-center shots. By flexing, the clubface reduces side spin and delivers the distance that golfers are expecting from the Launcher irons. Cleveland has also given the Launcher iron set a progressive shape as the irons increase in number. For longer irons, such as a 4-iron, the shape of the clubhead is lower and wider than the higher irons. By shaping these longer irons differently, golfers find that their ball flight is higher than they typically see from their previous long irons. With cutting-edge technology, the Cleveland Launcher HB is an excellent set for the mid-handicapper looking for longer distance and more forgiveness. TaylorMade has created an impressive set with the M4 Irons. 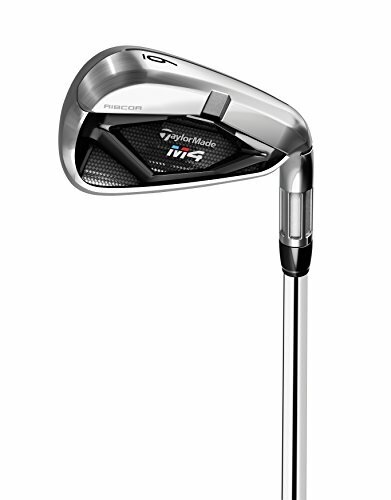 Showcasing a host of features that help the golfer keep the ball long and straight, the M4 irons utilize patented TaylorMade technology to provide a golfing experience that will vastly improve the game of mid-level players. With RIBCOR technology, the M4 iron set will increase distance, boost your launch angle for higher and softer entry shots into the green and provide maximum forgiveness for less side spin. All of these features result in one of the best upper-tier iron sets we’ve hit in a long time as the M4 irons delivers the goods. TaylorMade has created a dynamic new set of irons that raise the stakes for mid-level golfers looking to improve their distance and launch angle. The M4 Irons have been built to increase accuracy to help lower scores via closer entry shots into the green. Dependable construction is at the heart of all TaylorMade products and this attention to detail is what sets the M4 apart from other game-improvement irons. 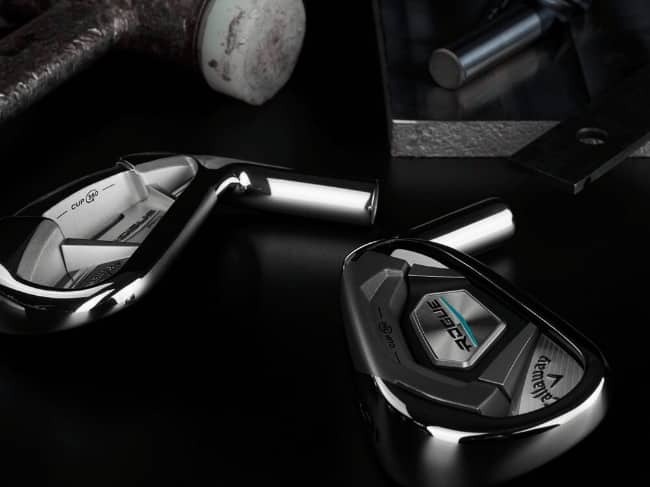 With the company’s strong research and development department, TaylorMade has produced a set with the M4 irons that is a terrific experience on the golf course. For the M4 irons, every feature utilizes TaylorMade’s patented RIBCOR technology. Starting with the clubface, the company has introduced a variety of details that increase the areas of the game that most mid-handicappers are looking to improve. From longer distance, higher ball flight and increased accuracy, the M4 brings the muscle to any golfer’s game. The first feature on the M4 irons is a Speed Pocket seen on the sole of the iron. Placed directly behind the clubface, the Speed Pocket primarily boosts ball speed. This feature helps on shots struck on the lower half of the clubface to propel forward without the punishment that lesser irons would place on the golf ball. The second feature on the M4 that uses the RIBCOR technology is the face slots placed alongside the grooves on the clubface. The face slots are two vertical bars that run from the top of the clubhead to the sole of the club. The slots stiffen the clubhead but allow for flexibility at impact that help direct more energy to the golf ball. And the final notable specification on the M4 irons is a lower center-of-gravity that improves launch angle. By increasing backspin, shots with these irons fly high and land soft. With outstanding features, the M4 irons are an excellent set for the golfer looking to make the leap to lower their handicap. 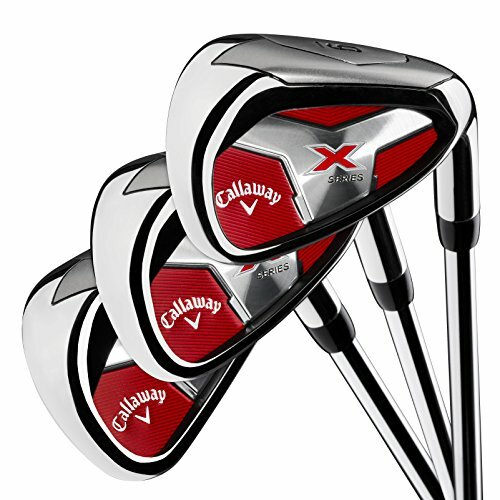 Callaway has designed a high-quality set of clubs for mid-handicappers with their latest version of the X-Series irons. Emphasizing distance with increased clubhead speed, the X-Series takes advantage of their perimeter-weighted cavity-backed design to promote exceptional shotmaking. The company has designed the X-Series irons with a low center-of-gravity to increase forgiveness without hurting your distance. Balls come off the clubface of the X-Series with a great feel for confidence that will carry you through a round. For a solid set that will assist the mid-handicapper in a variety of ways, the X-Series is a terrific set that provides a high performing experience. The X-Series irons from Callaway deliver power and accuracy to the mid-handicapper by using a newly designed club face to enhance forgiveness and boost distance. For golfers who are struggling with distance, the X-Series will give the weekend warrior several more yards of length with each shot. The best feature of X-Series is the perimeter-weighted clubhead. What we mean with perimeter-weighting is that the weight of the clubhead is evenly distributed around the back area located behind the clubface. This particular design helps with forgiveness because the weight isn’t placed in one location that would make the margin of error much smaller. Instead, the weight keeps the club moving smoothly through the golf ball so that there isn’t a reduction in clubhead speed and the potential to impart ugly side spin. 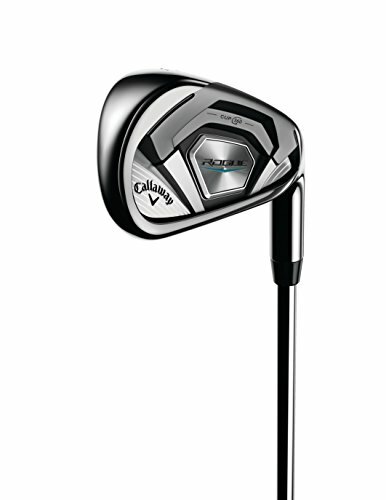 Callaway has also extended the sole of the X-Series irons so that the clubhead effortlessly moves through the grass to cleanly contact the golf ball. Smaller soles tend to bounce when they strike the turf causing inconsistent contact with the golf ball. The X-Series has a wider sole that keeps the iron balanced as it enters the turf and makes a path into the golf ball. Less bounce means consistent solid contact for the X-Series. Another area of improvement on these irons is the steel shafts that Callaway is using with this model. Made from stainless steel, these uniflex shafts are sturdy and stay true throughout the swing for enhanced feel and improved contact. The X-Series irons deliver a quality experience for the mid-handicapper by boosting their distance and keeping the ball on target throughout the round. From the additional forgiveness to the exceptional feel, the X-Series irons continually provided an excellent experience for the golfer looking to upgrade their equipment. There are a lot of options available on the M2 irons, and that could potentially overwhelm an inexperienced golfer. The TaylorMade M2 iron set is ideal for players looking to dip their toe into the lake of shot shaping. Most entry-level clubs are sledgehammers in that they have one single function; to get the ball up into the air and with distance. But the M2 irons have moved weight lower behind the clubface to provide incredible launch and dynamic control. TaylorMade’s Face Slot technology also corrals those errant tee shots that start on the toe or heel for exceptional forgiveness. Without a doubt, these M2 irons will boost your entry game into the green in considerable ways. 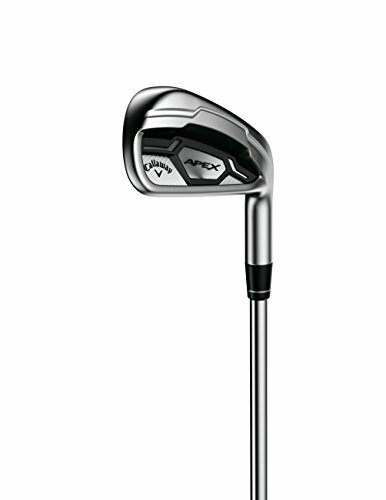 The M2 iron set is one of the best irons for mid-handicappers due to its innovative approach and enhanced technology. 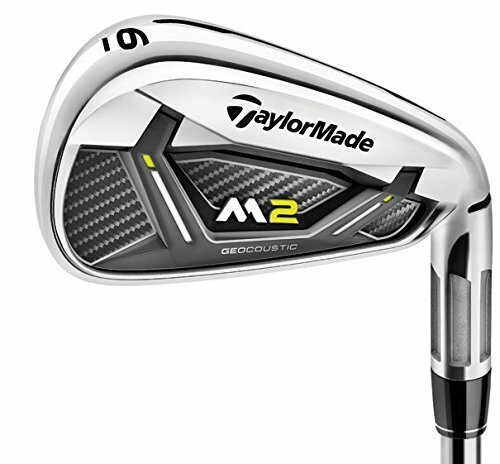 What TaylorMade set out to do with the M2 irons is help mid-handicappers with the accuracy of their shots. They attacked this common problem with the invention of Face Slot technology. What Face Slots do on an M2 iron is very important because it assists in keeping the ball headed toward the target. More specifically, these redesigned Face Slots maintain ball speed on off-center shots so that your shot doesn’t fall victim to elements such as wind or that dreaded sidespin that causes slices or hooks. Another alteration the company made with the M2 is relocating the center-of-gravity by moving weight lower behind the clubface. Simply put, a lower center-of-gravity forces the ball higher into the air. For mid-handicappers, by moving the weight lower, the M2 guarantees that golfers will get the maximum distance, height, and backspin when using the irons. TaylorMade has also given more attention to how the M2 irons react when they interact with the turf behind the golf ball. Irons react differently when then cut into the grass on the downswing, but what the M2 irons do is smoothly glide through the divot to enable clean contact with the golf ball. This clean contact is created through a unique design along the sole of all M2 irons. As a result, the M2 irons smoothly move through the turf and focus maximum clubhead speed onto the golf ball, where it belongs. By utilizing cutting edge technology, the M2 irons are a terrific option for mid-handicappers. With increased clubhead speed and maximum forgiveness, the M2 irons will help bridge the gap until your handicap reaches single digits. 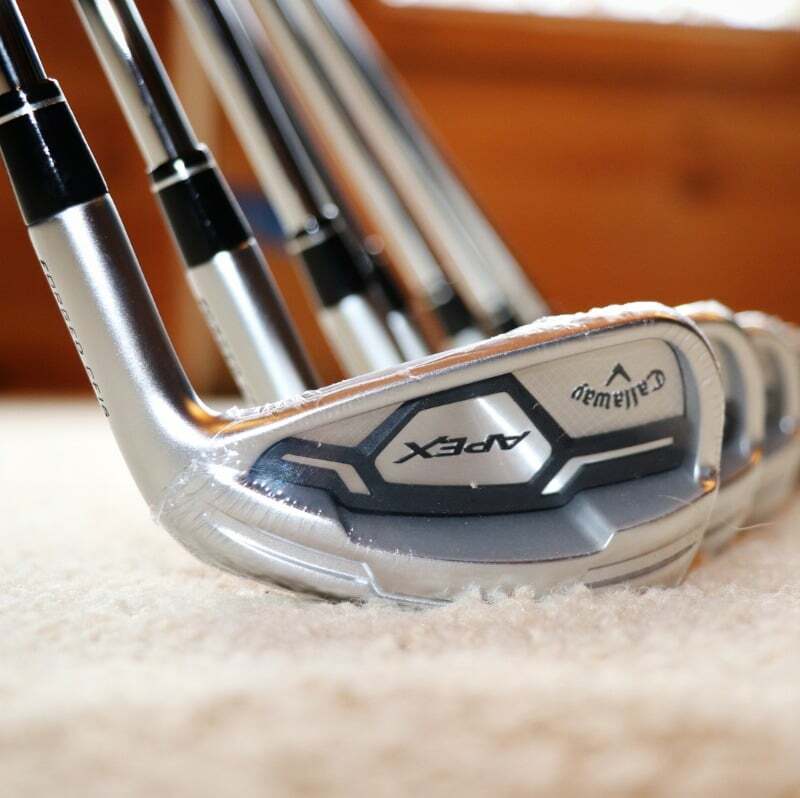 In the world of golf clubs, the brand Apex can be considered a legend, known for its high-end quality and beautiful design. 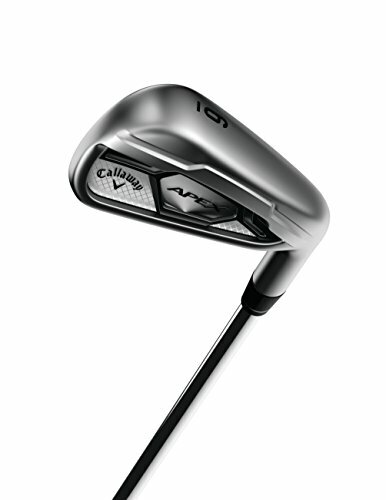 The brand Apex was recently re-launched under the Callaway brand, and Callaway has combined their touch of technology with the premium looks and overall quality, giving birth to a beautiful iron set that is not only good-looking, but also excellent in performance. 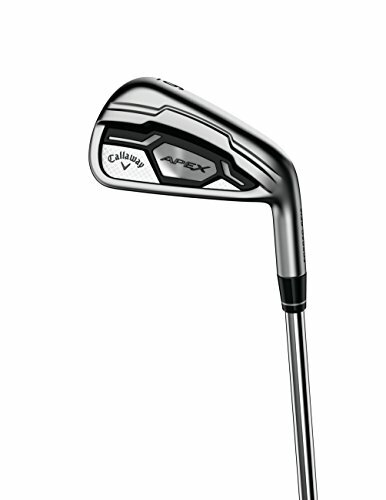 The Callaway Apex CF16 Iron Set features a multi-material forged head made of six different pieces, mainly a 17-4 stainless steel face, a 1025E forged carbon steel body, and other supporting parts to improve sound and feel. The CF16 adopts Callaway’s Cup Face technology in the 3- to 7- irons, which was first introduced in their 2015 fairway woods. The center of gravity (CG) placement is moved further backwards than your usual irons, which is achieved with a rounder rear edge on the sole. This CG placement allows an easier time to lift the ball and offers more forgiveness. This rounded edge is a little noticeable from 4-iron and above, but shouldn’t be a major compromise to the design. While the Cup Face is missing in the 8-iron all the way to the included wedges, it is replaced by an especially engineered face plate that feels just as good, giving you a consistent feel throughout the set. 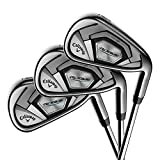 All clubs in the set have beautiful chrome and matte satin finish that is very beautiful and expensive-looking, as you can expect from a Callaway club set. Regarding looks, the Callaway Apex CF16 Iron Set is simply one of the most beautiful club sets available. The Apex clubs are always famous for their sound and feel, and they are retained in the Apex CF16. All the clubs in the set are very responsive with sharp, pleasing sounds. Even among forged irons, the Apex CF16 clubs are some of the best in this category. Regarding forgiveness, the Apex CF16 is more forgiving than out-and-out blade irons. The club faces are relatively small, especially with the shorter irons. Therefore, the Apex CF16 set is more suited for better mid-handicappers that are more consistent with their shots. The set will reward consistent players in feel, distance, and shot-shaping ability. The standard shaft for the set is the lightweight True Temper XP95 steel shafts. It feels very solid with excellent feedback, and is well-suited with the forged club heads. Our Verdict The Callaway Apex CF16 Iron Set is a very high quality iron set, as expected from both the Callaway and Apex brands. It is excellent in feel, sound, looks, and performance both in distance and shot-shaping ability. The multi-material forged heads are rewarding, especially for mid-handicap players that can produce consistent well-struck shots. It is not the most affordable set available, but the price is justified with the excellent quality. The relative lack of forgiveness can be a downside, making the Apex CF16 Set more suited for better mid-handicappers with a handicap of 15 and below. The new Callaway Rogue can be considered as a spiritual successor to the famous XR-series clubs, combining forgiveness with a relatively compact head, giving you the ‘pro’ look. This is arguably what made the XR clubs so successful, and those qualities -and more- are present in the Rogue Iron Set. The latest XR iron set, Steelhead XR Pro was an excellent set, but many Callaway fans were discouraged with its black matte finish. Thankfully, Callaway chose to go back to their classic chrome silver with the Rogue. Being a newer club, the Rogue features an updated, thinner 360 Face Cup technology, allowing the face to flex even more during impact compared to the Apex CF16. It also features a cavity back design, moving the weight distribution of the face along its perimeter, which will give you more forgiveness. 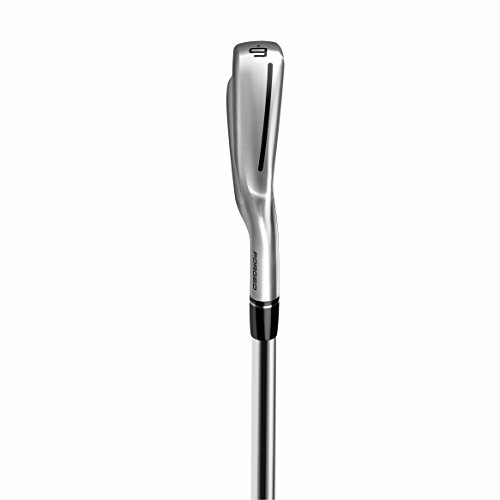 The thing about cavity back clubs is that the sound and feel are often compromised due to the specific design. 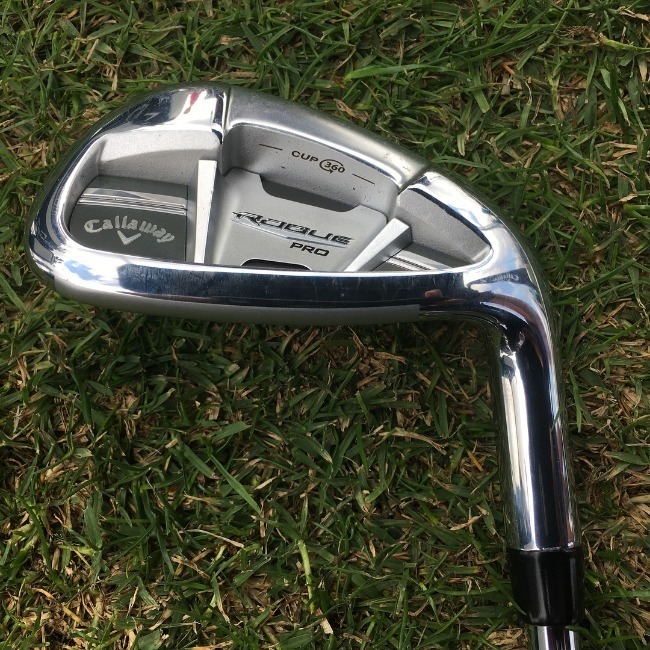 Callaway tackled the sound issue by utilizing Urethane Microspheres in the cavity back, and as a result, the Rouge irons sound very similar to forged blade irons. A minor downside, however, is that as the cavity goes bigger in the longer irons, causing the sound to be louder. 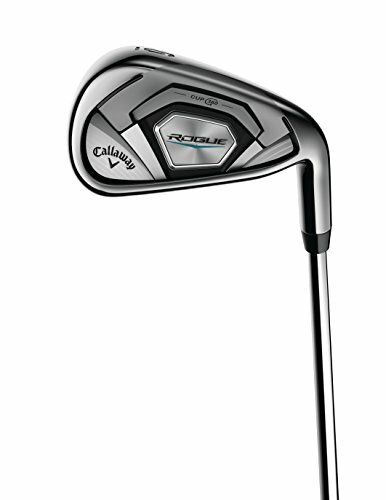 The Rogue is Callaway’s current flagship model for high and mid-handicappers, while the Callaway Rogue Pro Iron Set is designed for better high-handicappers with below 12 to 15 handicap, and the Epic Pro is their current better-player set. It is worth noting that the main difference between the standard Rogue and Rogue Pro is the weaker loft on the Pro due to the more compact, deeper head. It is still reasonably easy to launch the ball with the Rogue Pro clubs, however, especially when compared to the even weaker Epic Pro. So, the Rogue Iron set is an ideal match for high-handicappers with around 12 to 20 handicaps, while those with slightly lower handicaps will benefit more from the Rogue Pro set with its better shot-shaping playablity. 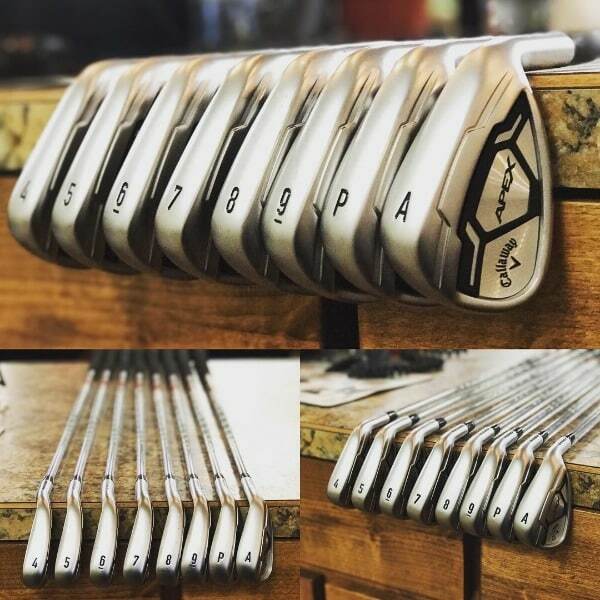 The Rogue offers a great feel throughout the set, and paired with its decent forgiveness, you get a very beautiful iron set with excellent performance. Another plus point is its versatility, as you can easily control various height trajectory with the irons. The irons are also relatively light, thanks to the True Temper XP 95 ST 15 shaft which is very light while being stable enough to maintain consistency. Regarding head size, it is a little bigger than the Apex CF16, while being a little smaller compared to the Callaway Steelhead XR Pro, its spiritual predecessor. In our opinion, the head size is perfect for mid-handicappers who want more forgiveness without sacrificing looks with bulky clubheads. 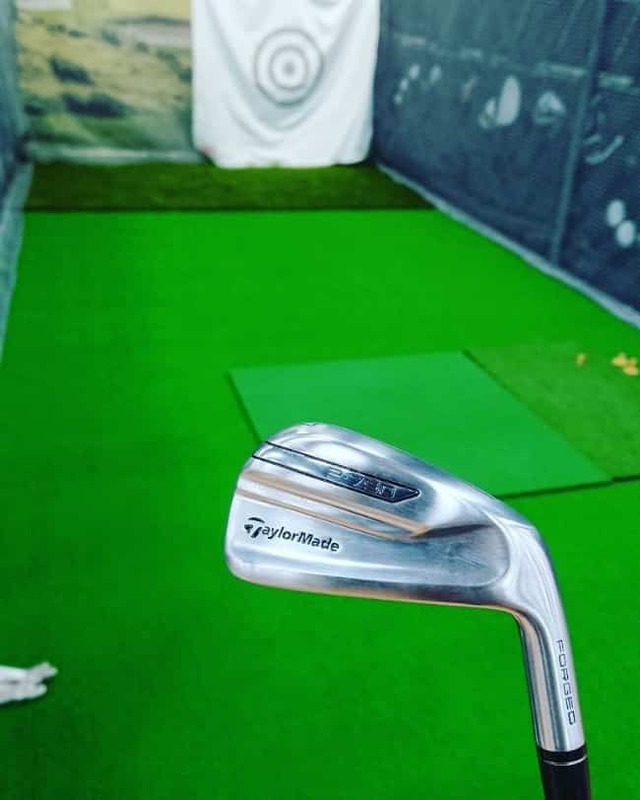 Although the head is relatively compact compared to most super game-improvement irons, it is surprising to find how the clubs felt powerful during impact, giving a lot of feedback without the annoying vibrations, again thanks to the very stable shaft. The design of the clubs, and especially on the cavity back part, is relatively simple, as you may expect from the classic Callaway. The Rogue comes in Callaway’s classic chrome silver finish, which is the favorite of many players and especially mid to low-handicappers. Newer Callaway clubs often feature colorful design on the back of the heads, but that’s not the case with the Rouge, which features simple black patterns and logo, giving it a classier look. Our Verdict In many aspects, the Callaway Golf 2018 Men's Rogue Iron Set offers a very rare balance of performance, looks, and forgiveness which is sought after by many mid-handicap golfers, especially those that are capable of producing well-struck shots but still deal with consistency issues. It features a cavity back design for more forgiveness but still sports a relatively compact head prefered by better players. It produces great sound and feel, and is very versatile on the course, giving you excellent control of trajectory. A minor downside is that it doesn’t have the shot-shaping ability of better-player iron sets, including the Apex CF16 discussed above. Yet, a pretty decent iron set for mid-handicappers offering well-rounded package. 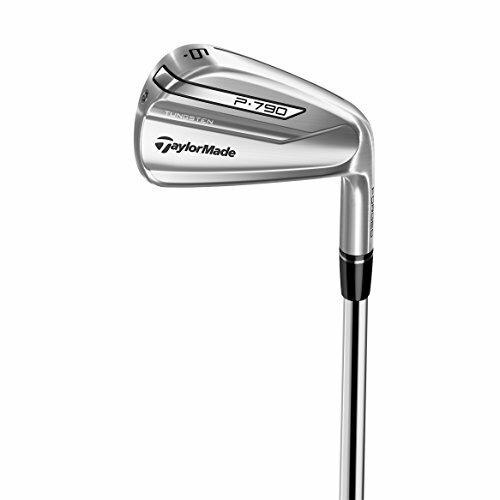 While the TaylorMade P790 is marketed as a forged iron set, it is technically not forged, at least not all of it. Most of the body is made from cast carbon steel, except for the face and the perimeter which uses forged carbon steel. So, the part that hit the ball is forged, and you will feel it during impact, especially on well-struck shots. But that’s not the only special thing about the P790 head. The space behind the forged part is hollow, filled with 4 grams of foam, dubbed the SpeedFoam, and is screwed in the toe. The SpeedFoam expands to four times its normal size inside the space, supporting the very thin forged face that is only 1.75 mm thick. This might sound as a new technology for TaylorMade, but they already used a foam inside the head with their RS irons back in 2009. Being very thin with a hollow head, you might wonder if the lightweight will be an issue. So, the 3- to 7-irons are weighted with high-density tungsten. The weight is placed on the lower-back part of the head, just below the cavity. This allows the center of gravity to move lower and further back, increasing the MOI and thus, forgiveness. TaylorMade’s answer to Callaway’s Cup Face technology is their Speed Pocket. The concepts are similar: allowing the face to flex more during impact, and so allowing faster ball speed even during off-center hits. Although it does have a cavity back design, the recessed part is very modest, giving the P790 a premium, professional look that will cater to many. 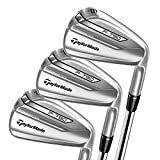 The blade size is thicker than average, which is typical TaylorMade, but we have to say that the P790 irons do look very good when you put it down at address. The name ‘P790’ comes from the length of the blade, which is 79 mm, and the thick head does feel and look powerful with a modern high-tech design but classy, premium look. 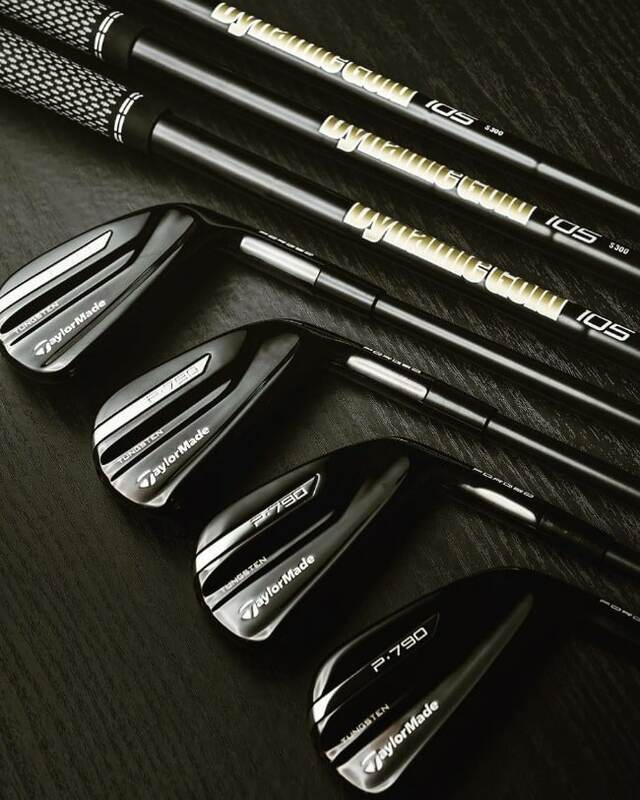 We have to say that regarding looks, the TaylorMade P790 irons are some of our favorite ever. The P790 is not all about looks either, and as expected from TaylorMade clubs, the irons are built for better performance in distance with high ball speed and low spin. This is thanks to the SpeedPocket technology and the relatively high lofts throughout the set. The head is relatively big without looking bulky, and so it has decent forgiveness. The highlight of the P790 is really the distance and impressive ball speed. To accompany the very fast head, there is the True Temper Dynamic Gold 105 shaft, which is ultra light and flexible. It does produce great feel, but if you have a swing speed above 110 mph, you might want to switch to a slightly heavier shaft with more stiffness. While the whole set feels and plays excellent, the 7-irons and upwards are on a whole other level. With the bigger head, we can feel the combination of tungsten weighting, Speed Pocket, and cavity back together, giving excellent performance and forgiveness. The 8-irons and wedges do feel a little lacking due to the loss of the tungsten weighting. The wedges, especially, feel a little to light, and might be an issue for better players with decent swing speed. The downside? Being a hollow club, the sound and feel does feel muted, although they do offer decent response on solid impacts. The hollow feel might also hinder consistency, and will take some time getting used to. Our Verdict The key highlights of the TaylorMade P790 Iron Set are speed and distance, which is typical from TaylorMade. It does offer proper forgiveness level for players around 12 to 20 handicaps, and they are really good looking clubs. In short, the P790 set is one of the best choices available on the market for mid-handicappers. With the hollow design, there is the compromise on sound and feel. With the ‘muted’ feel, the P790 set does lack consistency sometimes due to lack of response. Still, an excellent iron set especially if distance is your priority. Titleist AP1 and AP2 iron sets are some of the most famous iron sets for better players and mid-handicappers. The AP1 series have more forgiveness with bigger heads, while the AP2 clubs offer more rewarding playability on well-struck shots. Yet, a lot of golfers felt that the gap between the two set was really big, especially with their 716 AP1 and AP2. Titleist answer for this issue? The AP3, which is their newest entry in their 718 AP series. The key highlight of the AP3 is indeed the mid-sized head, which offers more forgiveness while still being compact enough for your classic better-player look down at address. The head is made up of a hollow blade design with a cavity just behind the Titleist logo. Also unique is the undercut design that is progressive throughout the set, with the 3- to 7- irons featuring high density tungsten weight, similar to the Titleist P790. This helps with the stability of the 17-4 stainless steel cast body. It has an L-shaped face insert, which is designed for more ball speed during low strikes. The 8- and 9-irons use the same 17-4 chassis, but the insert is also a 17-4 stainless steel for a more solid feel. 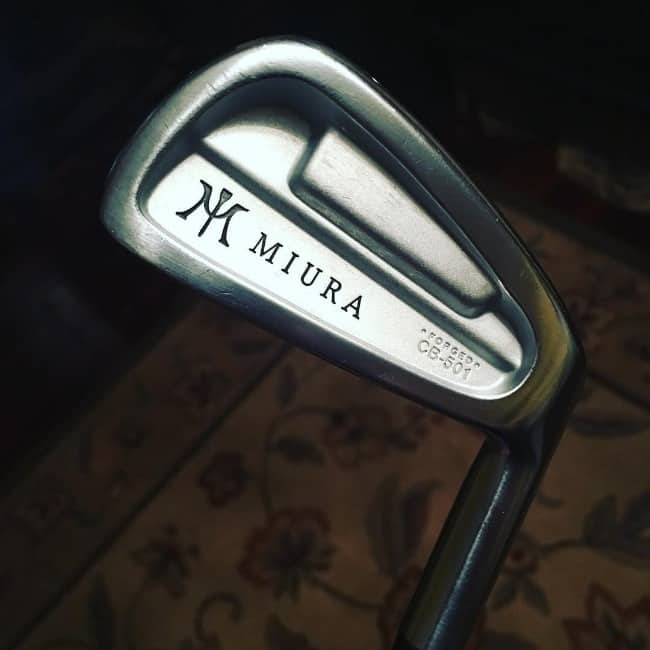 For the wedges, both the body and face use a solid 17-4 steel. These rather unique face constructions allow for more ball speed throughout the set. What about forgiveness? The AP3, while not as forgiving as the AP1, is very decent in forgiveness, thanks to the pre worn leading edge with a heavy sole with low center of gravity. So, it is quite easy to launch with the AP3 clubs. 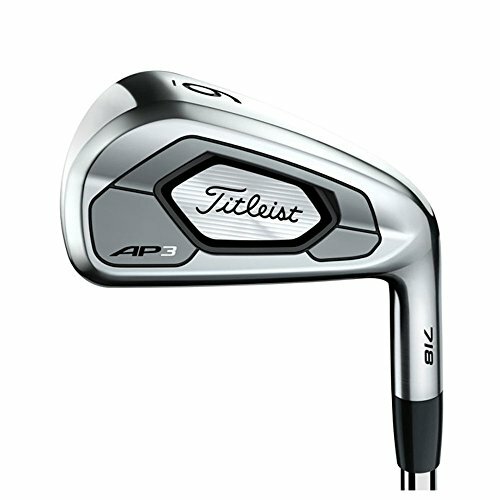 While the AP1 and the new AP3 are cast irons, the AP2 irons are forged with excellent sound and feel. We are pleased to report that the feel and sound are not much different with the AP3, which is very responsive with nice, pleasing sound. The 5-iron and upwards do sound a little more muted thanks to the bigger cavity, but it is still a manageable downside. Similar to the progressive approach used with the heads, the shafts are also progressive, with the default shaft choice being the True Temper AMT Tour Black: lighter in the long irons, and heavier in the short irons. Of course, you can also choose other options through Titleist’s custom fitting service. Our Verdict The Titleist AP2 is the most used irons in the PGA Tour for a reason: they are the most forgiving irons available for better players. 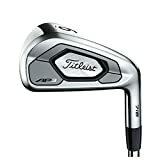 For mid handicappers, now there is the Titleist 718 AP3 where you can get the same sound and feel, equally good-looking clubs, with more forgiveness and bigger head without being too bulky. With this excellent forgiveness, consistent performance and good looks, it’s hard to find any fault with the Titleist 718 AP3. If any, the AP2 and other true blade irons do provide more playability and versatility, but the AP3 is simply and excellent choice for mid-handicappers and even single-digit handicappers. What players are considered as mid-handicappers? To answer this question, let us first briefly discuss the USGA handicap index. The handicap index is a rather complicated system to balance out a golf game between players of different skill levels. The result is a simple one or two digit number. So, for example, if you have a handicap of 12, and you are playing against a friend with a 10 handicap, he must give you three strokes during your match. Now, back to our topic. 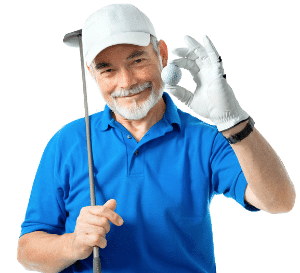 Although there is no official definition of handicap levels between low, mid, and high handicappers, the golf community generally agrees that you are a mid-handicapper if you have a handicap index between 11 to 20. According to USGA handicap statistics, there are over 40% of male golfers that belong to this category, so you are definitely not alone. A mid-handicapper is capable of hitting good shots with decent or even excellent distance. The issue here is consistency, as mid-handicappers often make plenty of mishits in between their decent hits. According to USGA handicap statistics, there are over 40% of male golfers are considered mid-handicappers. So, a mid-handicap golfer will benefit from clubs with more forgiveness to improve their consistency, but will also require a club that can reward good shots. An ideal mid-handicapper club should provide balance between forgiveness and playability. Which part of the game can irons for mid-handicappers help me with the most? There are two areas that new irons can help the mid-handicapper lower their scores. The first is with the lower irons, such as the 8 or 9-iron, where accuracy is vital from shots from inside 150 yards. Mid-handicappers need to have confidence in these lower irons because shots closer to the hole result in more birdie chances and increase the ability to save par on wild shots. The other areas that irons can improve the mid-level player’s game are with mid-range irons such as the 5 or 6-iron. These irons, especially when found in game-improvement sets, have larger soles and perimeter weighting for better forgiveness and control. Amateurs typically find that these middle irons are incredibly difficult to hit, so manufacturers have placed emphasis on creating mid-irons that boost distance and shot height. By buying new irons that are well suited for your skill level, you find that your golf game will change in exciting and different ways. New irons will dramatically reshape your shot making ability to assist in lowering scores. For the mid-handicapper, increasing accuracy, as well as distance, are areas that will significantly help shave strokes from the handicap. When should I consider buying an iron set for mid handicappers? High-handicappers, or beginner golfers will require irons with maximum forgiveness. Low, single-digit handicappers will look for more control and playability. Mid-handicappers, on the other hand, will look for a balance between both worlds. When should you look for that balance in your clubs? We have mentioned that we generally define ‘mid-handicappers’ as golfers with a handicap index between 11 and 20, so you can look for a mid-handicap iron set as soon as you pass that 20-handicap barrier. Should I pick an offset hosel? Using a club with an offset hosel is all about correcting a slice. Clubs that utilize an offset hosel allow the golfer to get their hands in front of the club head. By putting the golfer in this position, the club head will come down and through the golf ball offering a much better angle of attack for hitting the ball squarely. Since offset clubs are made to help golfers who slice hit the ball straight, manufacturers emphasize moving the center of gravity farther away from the shaft of the club. This placement helps the golfer’s chances of returning the clubface to square when coming into contact with the golf ball. By limiting the opportunity of leaving an open face at impact, the offset hosel gives the club head a fraction more time to return the face to strike the golf ball squarely. It may not seem like much of an advantage, but most slices hit by golfers are usually created because the club needs a split second more to return to square. There is a downside to using an offset hosel. Instead of correcting your swing flaw, you are instead relying on the equipment to make the correction. The golfer can develop lazy habits expecting the golf club to fix the issue later. How wide should the sole be on my irons? For mid-handicappers, a good rule of thumb is to find a club sole that is wider than your largest finger. Larger soles on golf clubs promote forgiveness but sacrifice control. But this is a sacrifice worth making for golfers who need more time to work on their swing. Positive feedback is crucial in developing a golf game. Golfers need to be rewarded on their best strikes, and larger soled clubs do just that. This is especially true for longer irons. If the golfer has not made the transition to hybrids with their long irons, then the irons must have a wide sole to help keep the ball on target as well as assist in getting the ball into the air. Wider soled clubs are considered to be game-improvement irons. These irons are specially made by equipment manufacturers to help higher handicap players obtain maximum height on their shots as well as increasing ball speed. Another benefit of wide soled clubs is that these clubs help the club bounce off the ground instead of slicing through the grass and dirt creating a large divot. This helps players who tend to sweep their swing rather than hitting down on the golf ball. Which head design should a mid-handicapper go for between cavity-back irons and muscle black/blade irons? A mid-handicapper should try to find the best cavity-backed irons that match their swing. The primary reason is that cavity-back irons are very easy to hit. For mid-to-high handicap golfers, cavity-back irons with wide soles usually fit under the game-improvement umbrella of clubs. With the weight redistributed around the perimeter of the club head, cavity-back clubs bring more stability and forgiveness to the golf ball. As a result, golfers who are not consistent with each swing can bring a level of consistency to each shot because of the advantages of the equipment. Blade irons are strictly for low-handicap golfers looking for control in their iron game. Golfers who play at this advanced level, love playing blades because it enhances their above-average skill set. Professionals prefer bladed irons because of the feedback they feel through the impact zone as well as the ability to shape shots on demand. Mid-handicappers should not even attempt to play bladed irons until their handicap falls into the lower range of average scores. Without the skill set of an advanced golfer, mid-handicap players will find bladed irons challenging to hit and should avoid until they are ready. Should I pick steel or graphite shafts for my irons? For mid-handicappers, there is an advantage to playing graphite shafts. Players with higher averages typically have slower swing speeds. The math is simple on this one as slower ball speed off the tee box means longer second shots into the green. The farther the golfer is away from the green, the less accurate the shot has the chance to be. Bad accuracy means fewer birdie chances and tougher to save par on wayward shots. Graphite shafts help mid-level players because they are lighter than steel shafts. Lighter clubs translates to increase swing speed. This is why you’ll always see graphite shafts in woods and hybrids. In irons, professionals prefer steel shafts because they feel that there is less twisting at impact but amateurs don’t have to worry about that as much because their swing speed is nowhere near the typical pro. Some amateurs like having steel shafts despite the weight difference to the club because they prefer the feel of steel at impact. Steel is more affordable when compared to graphite shafts, but for high-handicappers, the loss of up to 10 yards per shot may not be worth the extra change in their pocket. As a mid-handicapper, which irons should I avoid? Mid-handicappers should avoid irons that are built for either golfer needing super-game improvement help or bladed irons that low-handicap players use to shape shots. Super-game improvement irons such as the Wilson’s Ultra Set, are blunt instruments designed solely to lessen the learning curve of beginning golfers who have trouble getting the ball into the air and down the fairway. They have super-wide soles and perimeter weighting that redistributes the weight to the outer area of the clubface to promote forgiveness. Irons that are cavity-backed are typically super-game improvement irons. The hollowed out irons have a lower center of gravity allowing the beginning golfer to get the ball airborne quickly and easily. Bladed irons, such as the Mizuno MP 18 irons, are ideal for lower handicap players who can shape their shots with simplicity due to their elite skill set. That said, they have very little room for error. Super-game improvement irons do a great job at minimizing mistakes such as off-center hits, but blades don’t share the same benefits. Blade irons have a higher center of gravity, so shots fly at a lower angle with more spin. As a result, shots from a bladed iron must be hit in the sweet spot to reach maximum distance and height. Otherwise, the golfer is in store for a wild ride. What's the difference between irons for mid handicappers and low handicappers? Mid-handicappers need to look for golf clubs that help improve the quality of their shot making. Most amateurs suffer from the same faults: slow swing speed, poor or ill-fitting equipment, and bad fundamentals. New irons won’t solve all of these golfer problems, but they can improve ball speed as well as give the player the opportunity to reach their current potential. Mid-level players should be seeking game-improvement irons that will help them get the ball into the air. By assisting the golf ball to get higher, amateurs will find that their shots will carry farther resulting in the longest distances of their golfing life. A low-handicapper has less work to do on their game and instead are looking for the ability to shape their shots with precision. With an average score that is continually resting in the mid-70s, low-handicappers can benefit from bladed irons that have thin soles allowing the golfer more feel and control through contact. 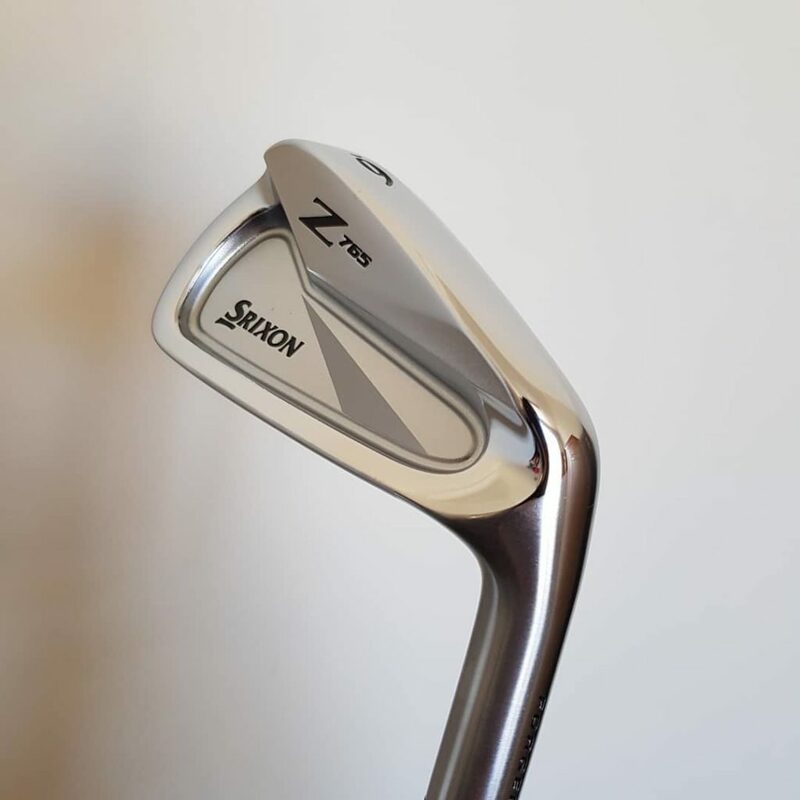 These upper-tier irons are usually expensive, but for the amateur looking to reach scratch golfer status, they are essential for lowering their scores. Single-digit handicap players are looking for better equipment over wholesale fundamental swing changes. What are the different types of irons available? The term ‘forged’ refers to how the metal material is shaped into the clubhead: a single piece of metal is heated into a rough shape, and then is hammered, ‘forged’ into the desired club-head shape. Nowadays, most forged irons are made of carbon steel, which are grinded, milled, and polished into the final shape. A forged iron is known for its solidity for being one-piece, with better feel and sound. Yet, they are also known for having a smaller sweet spot. A forged iron is generally better suited for low-handicappers looking for shot-shaping feature and trajectory control. With ‘cast’ irons, the material that was heated into liquid shape is poured into a mould, allowing more complex head designs and the combination of different materials. Casting a club head is far more affordable and easier than forging, and allow a bigger club head with intricate, more forgiving design. Cast irons are known for producing worse sound and feel compared to forged ones, but thanks to advancements in technology, they are much closer than ever before. What are the designs available for irons? The name ‘blade’ comes from the thin face and top line of these irons, with relatively small sweet spot. The advantage of a blade iron is the very balanced weight distribution throughout the entire head, and more weight is placed behind the compact sweet spot. Because the center of gravity is just behind the sweet spot, the blade irons offer more feel and shot-shaping ability, making it an ideal iron for better players with consistent shots. Also often called ‘muscle back’ irons. Also, generally a cavity back iron will have a relatively large clubhead and a thin clubface, allowing mishits to fly straighter than longer than a blade iron, making this type more suited for mid and high-handicap golfers. A hybrid club combine characteristics from irons with woods, and is designed to replace the long irons which are often very difficult to use, especially for high and mid handicap players. A hybrid features a hollow, rounded face of a fairway wood, but have the lie angle of irons with a flatter sole. As a result of this combination, a hybrid typically offers the distance and forgiveness of a fairway wood in combination with the accuracy and control of a long iron. A hybrid is generally an ideal pick for high to mid-handicap players. The key quality we should look for in a mid-handicapper iron set is the balance between forgiveness and playability: it has to be forgiving enough to allow more consistent performance, while it has to be rewarding enough on well-struck shots. Finding that balance can be really tough, and the four products we have reviewed above are some of the best in the market.